Things happen fast in Dubai, and the past 12 months have seen a year of revision—or, upheaval—for Art Dubai (20-23 March). Following the departure last year of the director Myrna Ayad, who oversaw two editions, the event has moved “away from having a single fair director”, a spokesman told The Art Newspaper last year. So the 13th edition is being directed “in tandem” by Pablo de Val, the artistic director since 2015, and Chloe Vaitsou, the former head of audience development for Frieze Fairs, who joined as international director in October last year. This year also sees the absence of the fair’s long-term sponsor the Abraaj Group, which filed for liquidation last summer after its founder was accused of misusing investor funds. Consequently, there is no Abraaj Prize which had become a focal point of the event—the prize was, Art Dubai organisers say, only ever intended to last for 10 years but in that decade it became an important institution for the region’s artists. So, all change. But then, the ever-adaptable Dubai specialises in change. Reflecting the multicultural disposition of the United Arab Emirate (UAE), the more than 90 exhibitors at Art Dubai—including newcomers such as Sprüth Magers (Berlin, London and Los Angeles) and Andersen from Copenhagen—hail from 41 countries. The aim for 2019, de Val says, is to make them feel “more interconnected: we have tried very hard to create an experience that drives you from one section to another”. Indeed, the Modern section for 20th century art—formerly cossetted away from the contemporary halls (and crowds) in the ballroom of the Jumeirah Mina A’Salam hotel—has been integrated into the contemporary section. “There is no real architectural barrier, you just will pass from the contemporary galleries to the Modern section,” De Val says. “We have two or three less [galleries], but the booths are much larger because in Mina A’Salam they had restrictions.” The talks programmes—the Modern symposium and the Global Art Forum—will now take place in the Modern section’s former space. Themed sections are de rigueur for art fairs and the residents section is joined by two new ones at Art Dubai this year—Bawwaba (made up of ten artists looking at issues related to the Global South, showing works produced within the past year) and UAE Now, which, De Val says, will “shed some light on the work of five local artist-run platforms in the UAE—Bait 15, Banat Collective, Jaffat el Aqlam, PAC (Public Art Collective) and Dafter Asfar. 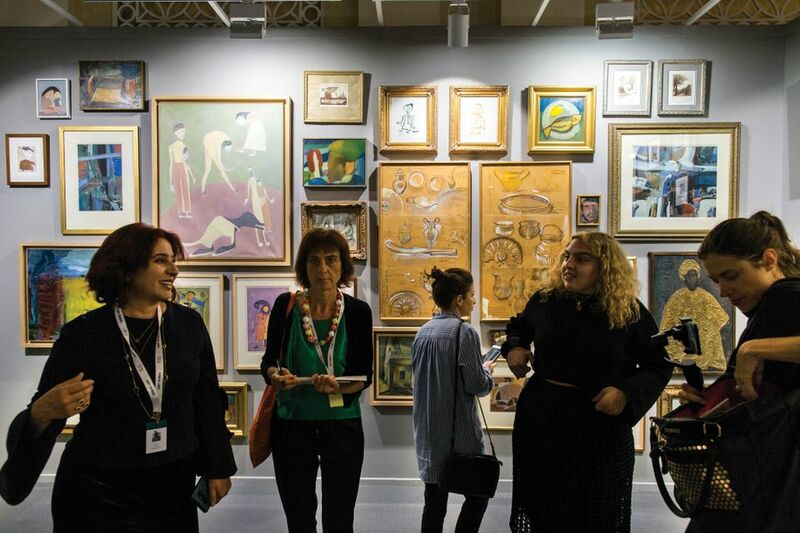 Misk Art Institute, an artist-centred Saudi Arabian cultural organisation founded in 2017, was very visible as a supporter of Art Dubai last year. But it is not involved in the event this year, Del Val says: “Last year they had a strong presence, sponsoring a non-selling exhibition and the Modern symposium, but it is about learning about each other and how we can learn from and nurture each other. The education programme [a collaboration between Art Dubai and Misk which works in both Saudi and the UAE) supporting young artists, was a more positive approach for both sides.” Official Saudi involvement at the fair this year is largely limited to the Ithra Art Prize for Saudi contemporary artists, launched in 2017 by the King Abdulaziz Center for World Culture (Ithra). It was won this year by Daniah Alsaleh for the audiovisual work Sawtam, which will be shown for the first time at the fair this year.